Specialized ratios of Phosphorous and Potassium collide together in a mixture that explodes blossom size and increases essential oils within the bloom. Noticeable increases in yield and quality are easily depicted in side-by-side presentations, which demonstrates the potential of this amazing bloom and fruit supplement. The natural concentration increases cost effective rate of overall gallons used and profit margins of crop production. Progressively increase your plant’s desire to eat more food; specifically Phosphorous and Potassium. Encourages a healthy root system throughout the flowering and fruiting periods. Increases size, weight and aromatic properties of all blooms produced. This BLOOM enhancer is formulated for the flowering phase of fast growing plants. This specialty fertilizer is intended primarily for non-farm use, such as home gardens. Apply every watering at a rate of 1 to 3 mL per gallon during the flowering or fruiting phase of plant development. 5mL is applicable for periodic feedings. Customize and tailor the New Millenium Feeding System specifically to your gardens needs. 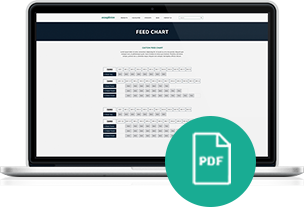 New Milleniums Feedchart is easy to follow for any grow phase.